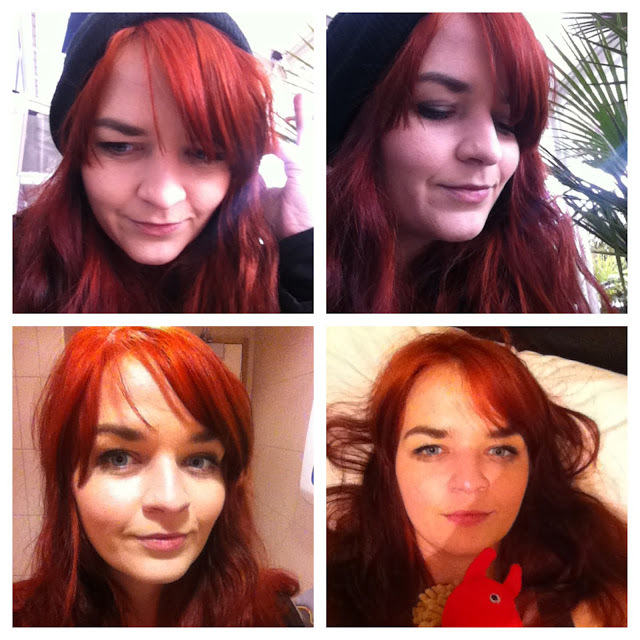 Lippy in London : Hair Adventures: Red-dy Round 2! Hair Adventures: Red-dy Round 2! You may have seen last week's post about my hair faux pas featuring Schwarzkopf Live Color XXL Luminance. Though this particular product is designed to lighten and colour dark hair, I failed to take notice of the fact that it wasn't going to do anything to the black dye that still lingered in my lengths. So I was left with a slightly bizarre light red on top, black through the lengths, fiery on the ends look that led my own brother to enquire as to why I looked like a 'red skunk head'. Whatever that is. Anyway, long story short, I wasn't happy rocking the reverse-ombre look but I wasn't ready to go back to the dark side just yet. What's a girl to do? Pop into Superdrug on her lunch break of course and pick up a packet of pre-lightener and two packs of red dye! I finally admitted to myself that if I wanted to turn my locks red, bleach was going to be involved. This is the result (in a variety of different lighting) after pre-bleaching with Clairol Born Blonde Lightener and two packs of Superdrug Colour Vibrance Permanent Colour in 8:45 Fire Red. I need to mention that the pre-lightener was really effective at lifting the black dye and was probably the most pleasant bleach I've used in terms of minimal stinging/ itchiness and odour! I did the dye job two days ago and washed my hair today and was a little surprised by the amount of dye that ran out when I washed it - the shower scene from Hitchcock's Psycho sprang to mind. Superdrug Colour Vibrance dyes are currently on offer at 2 for £4.99.